well there will be reports from myself, markus and nick eventually - as we've just got back from a fooking great weekend in italy.....gorgoeus women and some nice suprises and backstage passes for the star terk convention crew! I wanna see john, mark & steve C drool at this! thats it for now, time to catch up on some sleep - over to you markus & nick (and don't call me BEV KEV)! Tears aren't quite streaming yet Pete, could you rub it in a little more? I (and probably Nick too) am still recovering after one of the greatest events ever. Only got to bed at 5 a.m. after the gig due to the wicked DJ sets by Tony Wilson / Shaun Ryder / Peter Hook. Then had to get up at 9 a.m. to catch flight... Report and images to follow. Yup, still knackered, even after a 12 hour kip! Report will follow - what an amazing weekend! I don't think Ive heard them play Fat Shadow, San Francisco, Lift or Timebomb before although I may be mistaken. I love the heavy mix of lift, that crunchy groaning sample makes the track stand out. i'll gladly advertise the real AA! loved the new track Eastern Standard, always good to hear something we don't know, hopefully we'll get to hear it soon! Thanks for rubbing it in Kev! PS. Markus, when you're updating the discussion pages to include all the lucky people who went to Turin. Could you add the Tool-Shed and 808 DJ's gigs in Belfast to mine. July 2nd 2005 was a day when the world joined together to raise awareness of Poverty in Africa. Music was the central forum for spreading this message and concerts throughout the world ringed out the demands of the people in such a way as to be heard by all G8 world leaders. On Wednesday we will know if the G8 listened, how could they fail not to, and if they did music and democracy played a part in instilling change for the good of humanity. It's a shame it wasn't recorded so we can all share in the delight that is 808. Or was it?????? We need more on the live page. Yeah maybe if was recorded we may get to hear the odd song when Andy and Daz put together a radio show for Glastonbury in 2017! 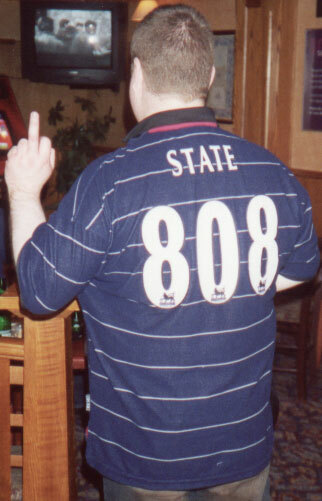 I saw a few bootleggers, I hope it will surface somewhere on the net, certainly the NewOrder set will, so maybe 808 too. I think Massey recorded it too, so maybe he'll be feeling generous after he's got the Japan & France gigs over with? Yes ,twas a strange weekend , Good to see the crew out in force in far flung lands...Hope you enjoyed the set not shure it all worked might drop some oldies out for Japan..Timebomb was a bit dodge ,and my sax playing was a bit rusty .. Still I thought New Order were on form ,really enjoyed their set. Top icecream though and entertaining weekend traveling with Mr Wilson and Ryder. No we didnt record ,we ll try and do Japan..theres just to much to think about when its all going off at things like that..It will probably be best to record Montpellier when its played in a bit..though its all random as to what equipment you get..
i thought i heard someone call Pete, but i'm used to bev kev nowadays, lol. sorry that i didn't spot you, we were desperate for the sangia at the spanish MADRID bar, even shaun ryder spotted me and pointed while we were in the nice and sweaty club (what the hell was tony playing - jump jump cds)! even Bez spotted me at Brixton, he copied my hand actions! won't say what they were! i agree Timebomb was the weakest track in the set, went a bit off key during it! so was Eastern Standard an unrelease number from Outpost? oh yeh Graham, i was stopped by some italians saying GREAT SET, WHY DIDN'T YOU PLAY ONE IN TEN, IS IT BECAUSE ALI CAMPBELL DIDN'T COME? i just said in a poor manc accent, Yeh man!